The new ATC Newmarket showroom is now open and boasts the same top attractions as our other stores. Visitors can find low online prices and a great range of products from leading tool brands. Our newest showroom in Suffolk is inside the Ridgeons Newmarket branch, which is just 5 minutes off the A14. The new showroom is located inside a Ridgeons branch and next to the Plumbstock showroom, which makes it ideal for tradesmen to find all the tools and materials you need in the same trip. 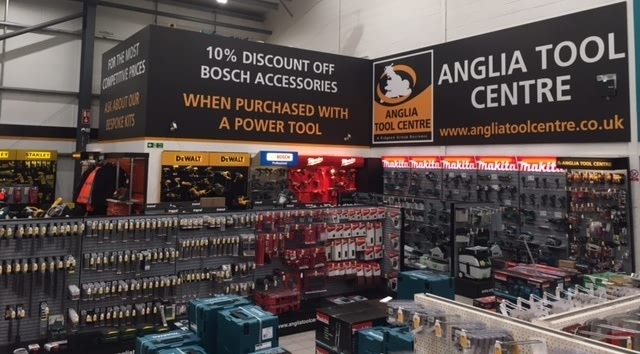 Also if you are a Ridgeons customer, you can use your account at Anglia Tool Centre (or vice versa, if you are an ATC account customer you can use your account at Ridgeons and Plumbstock). … when you purchase any power tool in store. Bosch accessories are extremely popular, from a recognised premium brand. This offer is a great way for tradesmen to top up on quality drill bits, saw blades and more. Our staff know their power tools and are on hand to help you find the right tool for the job. If you are in the area, drop by our ATC Newmarket showroom and we’ll be happy to help and discuss all things to do with power tools. Get hands on with a drill before you purchase by trying it out on our test bench. The wide range of power tools from each brand are on display, so you can get hands on and get the feel of the weight and size of a drill – the most used tool by tradesmen throughout the working day. Visit our ATC Newmarket Showroom at the Ridgeons branch, open 07:30 – 17:00, Monday – Friday and 08:00 – 12:00 on Saturday.